Overall, the smoke is clear, but not overpowering for carrying. The Sherryfasseinflüsse are rather manageable, but are noticeable. The alcohol has bite, but is justifiable. The overall picture is therefore actually consistent, even if the whisky is no real revelation. Spicy smoke, short citrus, a bit dusty. Liverwurst. Alcohol noticeably pungent in the nose. Vanilla and short rice pudding with cinnamon. Nutmeg. The more the alcohol evaporates, the more interesting and warmer the aromas are in the nose. Sweet smoke, ripe apples and pears, strong alcohol, a bit musty. Rather for non-classic sherry lovers than real peat. 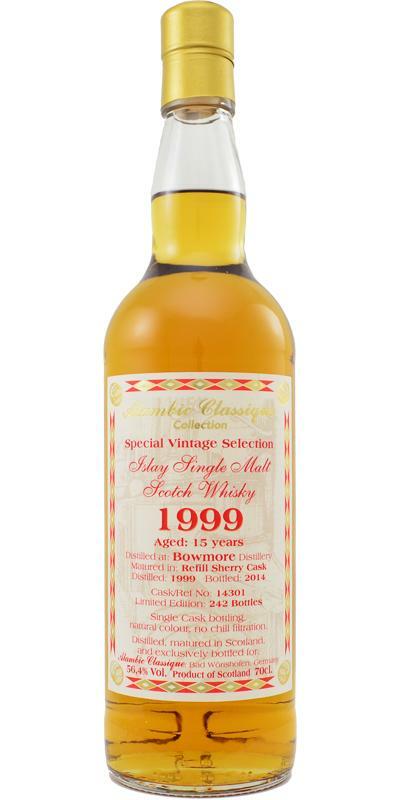 For a bowmore, little peat and rather spices, honey and a reminiscence of candied oranges. Alcohol is well integrated; the peat is also discreet and we find the approach of the nose: spices, honey, oranges. All with a beautiful material. Long enough, on spices, and peat always discreet.